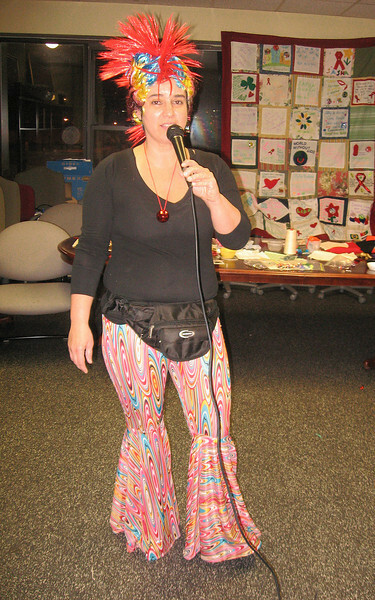 Staff and volunteers from the MAPS Disease Prevention & Education Programs hosted a party Dec. 16 in the agency's Cambridge headquarters to raise awareness about HIV/AIDS in the community.The 'HolidAIDS' party was one of many activities in which MAPS has been involved to commemorate World AIDS Day throughout December. Participants could learn about HIV/AIDS while enjoying delicious food from the Portuguese- and Spanish-speaking countries, joining in karaoke songs, creating AIDS-related crafts, having their faces painted, and viewing artwork on the walls. The staff also displayed a community AIDS quilt and flags from Portuguese- and Spanish-speaking countries. Each flag was labeled with information about numbers of people living with AIDS as well as cumulative related deaths in that specific country.